Infection with human immunodeficiency virus type-1 (HIV-1) requires binding of the viral envelope gp120 to CD4 and to the CXCR4 coreceptor. Both, gp120 and CXCR4 are subject to N-glycosylation. Here we investigated the influence of the N-linked glycans g1 and g2 present on CXCR4 for HIV-1 infection. The two CXCR4 N-glycosylation sites g1 (NYT) and g2 (NVS) were mutated by changing the first or third amino acids N or T/S to Q and A respectively (g1; N11Q or T13A; g2, N176Q or S178A). Human osteosarcoma cells (GHOST) expressing human CD4 and the various CXCR4 glycosylation mutants were tested for infection using NL4-3-based viruses with X4, R5 or R5X4-tropism differing only in the V3 loop region. All constructed cell lines expressing the various CXCR4 glycomutants showed similar permissiveness for the X4-monotropic virus and no change in the coreceptor specificity that allows infection of a CCR5-dependent R5-monotropic virus. Interestingly, the removal of glycan g1 significantly enhanced the permissiveness of GHOST cells for the R5X4 dualtropic virus. GHOST cells expressing the CXCR4-g1 or CXCR4-g1/2 mutants were infected at higher rates by the R5X4-dualtropic virus compared to cells expressing CXCR4-wt or CXCR4-g2 coreceptors. Our present observations underscore a role for glycans present on the CXCR4 coreceptor in the entry process of HIV-1. The data will help to better understand the multifaceted mechanism of HIV infection and the selective forces which drive HIV-1 evolution from mono- to dual-tropism. The chemokine receptor CXCR4 belongs to the seven-transmembrane-domain G-protein-coupled receptor family and is one of the major coreceptors for human immunodeficiency virus type 1 (HIV-1) [1, 2]. The trimolecular interaction between the HIV-1 receptor CD4, CXCR4 and viral envelope proteins (gp120/gp41) is the first step in HIV entry. Binding of gp120 to CD4 triggers conformational changes responsible for binding to the coreceptor. Binding to coreceptor is followed by further conformational changes in the gp41 subunit which lead to membrane fusion [3–5]. The N-terminal region and extra cellular domains of CXCR4 are of particular importance for the interaction with the third variable loop (V3) of HIV-1 gp120 [6–8]. While HIV-1 infection is dependent on the interaction between at least three different molecules, viral entry can be influenced by changes in the V3 region of gp120 or changes in the N-terminus and in the second extracellular loop (ecl-2) of CXCR4. [9–12]. In general, amino acid exchanges within the gp120 V3 loop affects coreceptor usage, viral infectivity or can promote escape from neutralizing antibody. Due to amino acid variations, the potential N-glycosylation sites within the V3 loop region can be altered also. Thus, N-glycosylation is abolished or an additional glycosylation site is created. The whole gp120 is a highly glycosylated protein which contains between 23 and 25 potential sites for N-glycosylation carrying glycan structures of the high mannose as well as complex type. Since gp120 contains such a high amount of carbohydrate residues, more than 50% of its molecular mass is represented by these sugars [13, 14]. We have previously shown that the lack of some N-glycan structures within the gp120 V3 loop of the HIV-1NL4–3 strain results in enhanced infectivity for CXCR4 expressing cells and in increased resistance to the inhibitor SDF-1α. . Viruses with functional glycosylation sites had lower infectivity compared to the mutated deglycosylated ones but were more resistant to neutralizing antibody. These data were confirmed by studies of Pollakis et al. who have shown that the loss of the V3 loop N-Glycan at position N301 had a major influence on CXCR4 coreceptor usage. These V3 loop sugars also play a role in the development of viruses able to use CXCR4 in addition to CCR5 . Such an accumulation of CXCR4-usage is linked to the development of viruses representing the SI (syncytia inducing)-phenotype. The shift of the viral population from CCR5-monotropic viruses, which represent the NSI-phenotype, to viruses of the SI-phenotype is a harbinger of progression to AIDS [18–20]. These experiments provide evidence for a role of V3 loop based sugars for the development of viruses that can use CCR5 in addition to CXCR4. In the same way as gp120, the CXCR4 coreceptor is also N-glycosylated. CXCR4 contains two potential N-glycosylation sites g1 (aa pos. 11–13) and g2 (aa pos. 176–178) within the N-terminal region and within the second extracellular loop. Mutants of CXCR4 lacking N-glycosylation sites g1 and/or g2, which were expressed by insect cells, exhibited a decreased binding activity and affinity for the natural CXCR4 ligand SDF-1α . More recently it was reported that the loss of the N-terminal N-glycan g1 allows CXCR4 to serve as a coreceptor for some R5 monotropic HIV-1 strains . Thus, CXCR4 glycan g1 seems to be involved in SDF-1 binding but is also involved in masking the coreceptor function for CCR5-dependent viruses. Despite these results the influence of N-glycans on HIV-coreceptor interaction is not fully understood. It remains to be speculated whether N-glycosylation of CXCR4 plays a role in the development of CXCR4-specific viruses by adapting CCR5-dependent viruses step by step to CXCR4. In this study, we investigated the role of the N-linked glycosylation of CXCR4 for viral infectivity. The N-glycosylation sites of CXCR4 were altered by amino acid exchanges to generate genetically engineered mutants of CXCR4 with and without N-glycosylation sites. To study infectivity, GHOST cells expressing the CXCR4 mutants were infected with recombinant viruses which only differ in the V3 loop region and therefore in their CXCR4 and CCR5 coreceptor usage. We found a significantly enhanced infectivity for viruses able to use both coreceptors due to the lack of CXCR4 glycosylation. The difference in CXCR4 glycosylation might lead to different distinct conformations, which promote infection of dualtropic isolates. The presence of CXCR4 in different glycosylated or partially glycosylated forms might be relevant for the different antigenically distinct conformations of CXCR4 detected on primary cell types  and for the differential recognition of CXCR4 by HIV-1 isolates based on a more accessible CXCR4 N-terminus. The results provided will help us to better detail the steps of CXCR4 – gp120 interaction and to further our understanding on the multifaceted mechanism of HIV infection on a molecular level. Hela-P4 cells (provided by M. Dittmar, Heidelberg, Germany) were grown in Dulbecco's modified Eagle's medium (DMEM; PAA Laboatories, Linz, Austria) containing 10% fetal calf serum (FCS; Biochrom KG, Berlin, Germany). The human osteosarcoma cell line (GHOST; provided by D. Littmann, ) and the amphotropic helper-free packaging cell line Phoenix (provided by G. Nolan, Stanford, USA) were both cultured in DMEM supplemented with 10% FCS. GHOST cells expressing human CD4 were grown in medium supplemented with 500 μg/ml G418 (Life Technologies, Karlsruhe, Germany). GHOST cells expressing CD4 and the CXCR4 coreceptor were grown in medium supplemented with G418 and 1 μg/ml puromycin (Sigma, Deisenhofen, Germany). For infection assays we have used recombinant viruses showing X4, R5 and R5X4 tropism differing in the V3 loop region only. We used X4-tropic NL4-3 or R5X4- and R5-tropic NL4-3 mutants which were constructed by replacing the V3 region within the recombinant retroviral vector pNL4-3BstII. By replacing the V3 region against the V3 loop region from two primary isolates PI-991 and PI-952 two recombinant NL4-3 mutants were generated showing R5 and R5X4 tropism (R5-monotropic, NL-991; R5X4-dualtropic, NL-952). The method on how to replace the V3 region within the pNL4-3BstII vector is described in its full details by Polzer et al. .
Retroviral vector DNA of the three different recombinant HIV clones was purified from bacteria (strain XL-1 blue, Life Technologies) using a plasmid purification kit according to the manufacturer's recommendations (Macherey & Nagel NucleoSpin Plasmid, Düren, Germany). Purified DNA resuspended in FuGENE-6 transfection reagent (Roche, Germany) at 1 μg/100 μl was used for transfection of Hela-P4 cells. Cells were cultivated up to 4 days post transfection in DMEM. Virus production was measured by a standard p24 enzyme-linked immunosorbent assay (ELISA) based on reagents and the protocol provided by the European program EVA (Centralized Facility for AIDS Reagents, Hertfordshire, UK). Hela-P4 supernatants containing equal amounts of infectious virus, standardized for equal amounts of p24 antigen, were used for the infection of GHOST target cells expressing human CD4 and the CXCR4 glycosylation mutants. To generate CXCR4 mutants differing in N-glycosylation we used pcDNA3 (Invitrogen) CXCR4 expression vectors provided by M.T. Dittmar. CXCR4 mutations were induced by site-directed mutagenesis using a QuickChange mutagenesis kit (Stratagene, Heidelberg, Germany). For each mutation two polyacrylamide gel-purified oligonucleotides were used and mutations were induced according to manufacturer's instruction. In brief, the two primers containing the point mutations, each complementary to opposite strands, were annealed to the denatured plasmid DNA. After adding DNA polymerase, in-vitro DNA synthesis will generate mutated plasmid copies made of non-methylated dsDNA. Non-methylated DNA is resistant to Dpn1 enzyme cleavage. Thus, the parental plasmid DNA can be digested with DpnI. This primer-based mutagenesis procedure selects for the in-vitro generated mutated plasmid copy. The presence of each point mutation and the absence of other mutations were confirmed by sequence analysis (CEQ2000 DNA Analysis System, Beckman Coulter, Germany). Mutated CXCR4 genes were cloned into the unique EcoRI restriction site of the pBABE-puro vector [36, 37]. To establish coreceptor expressing GHOST cells we used the Phoenix packaging cell line to generate infectious MMLV supernatants. Phoenix cells were seeded in 6-well culture dishes and transfected with pBABE-CXCR4 plasmids using the FuGENE-6 transfection method as described above. Three days post infection, viral supernatants containing infectious MMLV particles were harvested and diluted 1:2 in DMEM supplemented with polybrene (8 μg/ml; Sigma, Germany). GHOST cells cultured in 48-well dishes were incubated with the MMLV supernatants. Three days post infection puromycin was added (1 μg/ml) and GHOST cells were cultured up to two weeks for puromycin selection. After two weeks, cell clones were isolated and cultivated for another two weeks. Coreceptor surface expression of CXCR4 and mutated CXCR4 was determined by fluorescent antibody staining using the conformation-dependent phycoerythrin labeled monoclonal antibodies (mAbs) 12G5  (Pharmigen, Hamburg, Germany). Cells were washed twice with phosphate-buffered saline (PBS) containing 1% FCS and 0.05% sodium azide at 0°C. GHOST cells (1.0 × 106/ml) were stained using 20 μl of the 12G5 mAbs solution for 30 min, After washing three times with PBS/1% FCS/0.05% sodium azide, FACS analysis was carried out using a FACSCalibur (Becton Dickinson, Heidelberg, Germany) flow cytometer. To perform HIV-1 infection studies GHOST cells stablely expressing wild-type or mutant CXCR4 were seeded in 96-well tissue culture dishes (1.0 × 103 to 3.0 103 cells per well) and were infected with virus standardized for p24 antigen levels (NL4-3, 0,05 ng p24/well; NL-991, NL-952, 0,05 ng p24/well). After 18 h cells were washed three times with PBS, 200 μl DMEM supplemented with 0.5% FCS. Viral production was monitored on days 2, 3, 4, 6, 8 and 12 by a standard p24 antigen ELISA. For the detection of p24 antigen, 96-well plates (Maxisorb, Nunc) were coated with anti-p24 peptide-specific goat antiserum D7320 (Biochrome, Germany) diluted 1:100 in 150 mM NaHCO3 (pH 8,5). Plates were stored over night at 4°C, washed 6 times with PBS/Tween20 (0,05%) and blocked using PBS/Tween20 buffer containing 10% FCS (1 h, RT). After FCS blocking, plates were washed 2 times and cell culture supernatants were added to the wells in a final volume of 100 μl. After 1 h at room temperature, plates were washed 6 times with PBS/Tween20 and 100 μl anti-p24 rabbit antiserum diluted 1:2000 in PBS/Tween20/FCS buffer was added to each well (anti-p24 rabbit serum was provided by H.-G. Kräusslich, ZMBH Heidelberg). Bound rabbit antibody was detected with secondary anti-rabbit IgG-specific antibody conjugated to alkaline phosphate using p-nitrophenylphosphate (Bio-Rad alkaline detection kit) as a substrate. The assay was standardized using the p24 antigen standard provided by the National Institute for Biological Standards and Control (NIBSC, Herts, UK). The p24 standard was diluted in PBS/Tween20/FCS and was applied to each well at 200, 67, 22, 7.4, 2.5, 0.8 and 0,27 ng/ml concentrations. The linear range of the p24 assay was between OD405nm = 0,2–1,5 [(OD405nm – 0,1) / 0,04 = ng p24]. CXCR4 contains two potential N-glycosylation sites at amino acid position 11–13 (NYT) and 176–178 (NVS) (Fig. 1a). To generate mutants of CXCR4 differing in N-glycosylation we have introduced point mutations changing the coding sequence for asparagine, threonine or serine into the coding sequence for glutamine and alanine (Fig. 1b). Using the pBABE-puro cloning and expression system GHOST.CD4 cells were transfected to express wild-type CXCR4 (CXCR4+g1g2) or mutated CXCR4 lacking g1 and/or g2 (CXCR4-g1, CXCR4-g2, CXCR4-g1g2). CXCR4 expression was monitored by FACS analysis using the CXCR4-specific antibody 12G5 (Fig. 2). CXCR4 wt (CXCR4+g1g2) was set to 100% and both CXCR4-g2 mutants showed identical CXCR4 expression levels. In relation to GHOST.CD4.CXCR4+g1g2 cell line. CXCR4 expression was reduced by 20% for the two CXCR4-g1 mutants and by 15% for the CXCR4-g1g2 mutant. Between mutants lacking g1 or g2 but differing in the first or third position of the glycosylation site (i.e. N11Q versus T13A, Fig. 1b), we observed no significant difference in CXCR4 expression levels. CXCR4 extracellular domains and CXCR4 mutants generated. A, two recognition sites for N-linked glycosylation, designated g1 (aa (NYT, pos. 11–13) and g2 (aa NVS, pos. 176–178) are located in the extracellular CXCR4 domains. B, by replacing the first amino acid N against Q and the third amino acid S against A a set of five CXCR4 mutants lacking g1, g2 or both glycans were generated. Amino acids: A, alanine; N, asparagine; Q, glutamine; S, serine; T, threonine; V, valine; Y, tyrosine. CXCR4 cell surface expression. The CXCR4 coding sequence was mutated in the pcDNA3.1 plasmid, cloned into pBABE-puro and finally expressed in GHOST.CD4 cells. Cell surface expression was monitored by flow cytometry using phycoerythrin labeled anti-CXCR4 mAb 12G5. 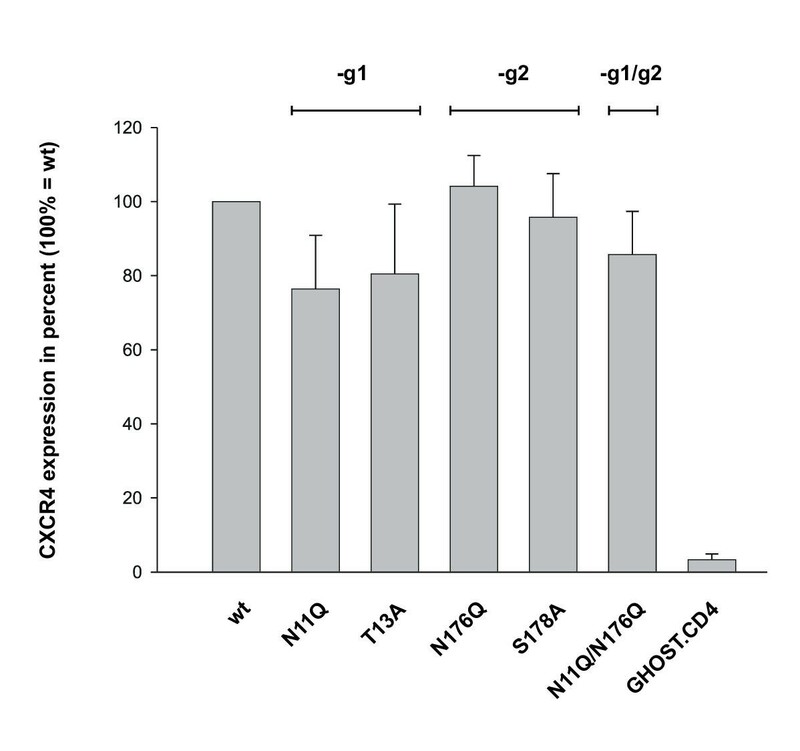 Coreceptor expression is expressed as % of CXCR4 wt expression of GHOST.CD4.CXCR4 cells. Error bars are calculated based on three independent experiments. We have established a cloning system based on the NL4-3 virus that allows the exchange of the gp120 V3 loop. Two V3 sequences taken from a R5- and a R5X4-tropic primary isolate (PI-991, PI-952) (Fig. 3a) were introduced into the NL4-3 env gene (Fig. 3b). The resulting NL4-3 env – V3 loop chimeras (NL991, NL-952), only differing in the V3 loop sequence, showed exactly the phenotypes of the original primary isolate. The exchange of the V3 loop was sufficient to change the original NL4-3 phenotype from X4- to R5-tropism (NL-991) and from X4- to R5X4-dualtropism (NL-952). The three recombinant viruses NL4-3, NL-991 and NL-952 (Fig. 3c) were used for the infection of the cells expressing the various CXCR4 g1/g2 mutants. Construction of NL4-3 mutants differing in coreceptor usage. A, Amino acid V3 loop sequence of the NL4-3 laboratory strain and of two primary isolates PI-952 (R5X4-dualtropic) and PI-991 (R5-monotropic) of different phenotype. B, V3 loop regions of patient isolates were generated by PCR amplification followed by a second PCR. In the second PCR amplification silent mutations were introduced to generate the BglII and NheI restriction sites. 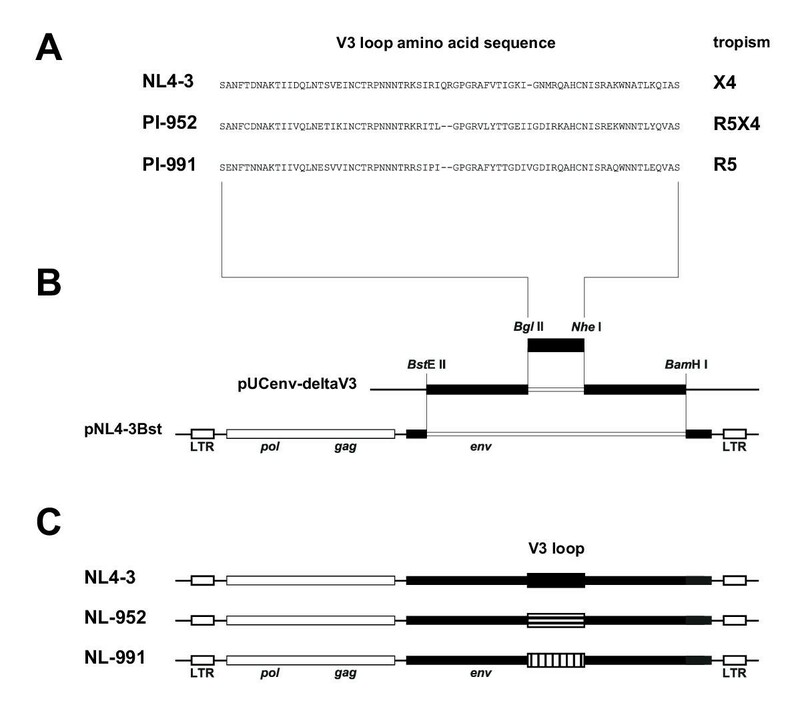 PCR fragments were cloned into pUCenv-deltaV3 and the NL4-3 env – V3 loop chimera was cloned into the pNL4-3Bst retroviral vector as a BstEII/BamHI fragment. C, This V3 cloning procedure was carried out to generate mutants of NL4-3, designated NL-952 and NL-991, containing the V3 loop and the coreceptor phenotype of the of the original primary isolates. NL4-3, X4-monotropic; NL-952, R5X4-dualtropic; NL-991, R5-monotropic. GHOST.CD4 cells expressing the various CXCR4 glycosylation mutants were infected with equal amounts of NL4-3, NL-911 and NL-952 virus. Virus supernatants, derived form HelaP4 cell cultures, were standardized based on the level of p24 antigen. To study differences in CXCR4-specific infection the various GHOST.CXCR4 cell lines were infected with an equivalent of 0,5 ng of p24 for each of the three viruses. Infection of GHOST cells with NL4-3 using an equivalent of 0,5 ng p24 leads to 100% infection within the first two days (data not shown). Therefore, NL4-3 infection studies shown (Fig 4a) were carried out with 0,05 ng p24 for each of the 96-wells. All experiments were carried out in triplicate. Virus replication and CXCR4 glycosylation. GHOST cells expressing CXCR4 wt or CXCR4-g1, -g2 or -g1/g2 were infected with equal amounts of (A) the X4 tropic strain NL4-3 (0.05 ng p24 / 3 × 10e3 cells), (B) the R5X4 dual-tropic virus NL-952 (0.5 ng p24 / 3 × 10e3 cells) and (C) the R5 tropic HIV-1 NL-991 (0.5 ng p24 / 3 × 10e3 cells. Virus production was measured by a standardized p24 antigen ELISA [(OD405nm – 0,1) / 0,04 = ng p24, linear range OD405m 0,2–1,5]. Values are calculated based on two independent experiments. White symbols GHOST.CD4 cells expressing CXCR4 lacking g1, black symbols GHOST.CD4 cells expressing CXCR4 containing g1. To study differences in permissiveness of the various GHOST cell lines viral replication of NL4-3, NL-991 and NL-952 was monitored over a period of 12 days (Fig. 4a,4b,4c). The results demonstrate that cells expressing the CXCR4 mutants were infected at similar rates by NL4-3 and we observed no differences in permissiveness for cells expressing CXCR4 with or without g1 and/or g2. Thus the lack of g1 or g2 on CXCR4 did not influence infectivity for the X4-monotropic strain NL4-3. Both sugars also had no effect on cell permissiveness for the R5-monotropic NL-911 virus (Fig. 4c). Thus, lack of g1 and/or g2 on CXCR4 does not lead to a shift of the coreceptor specificity to allow CCR5-dependent viruses the entry via one of the CXCR4 coreceptor mutants. In our experiments no evidence was provided that a potential binding epitope on CXCR4 for CCR5-dependent viruses is masked by glycans g1 or g2. 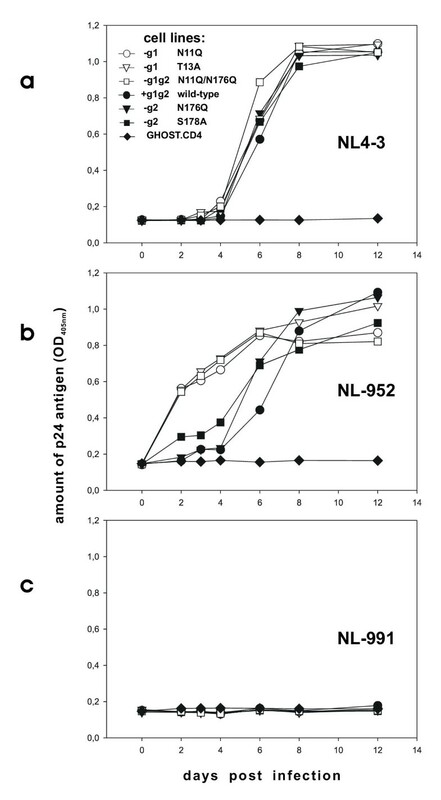 Interestingly, the infection studies of GHOST cells expressing the various CXCR4 mutants with the dualtropic virus NL-952 revealed a significantly enhanced permissiveness for NL-952 due to the lack of g1 (Fig 4b). Cells expressing CXCR4-g1 (N11Q, T13A) or CXCR4-g1g2 (N11Q/N176Q) were infected more efficiently by NL-952 compared to those cells expressing CXCR4+g1 (wt, N176Q, S178A). Although the CXCR4 expression level of the three GHOST.CD4.CXCR4-g1 cell lines (N11Q, T13A, N11Q/N176Q) was significantly lower (Fig. 2), their permissiveness for NL-952 was higher (Fig. 4b). By testing all the various cell lines we observed a clear cut between higher permissiveness of the CXCR4-g1 and lower permissiveness of CXCR+g1 expressing cells for the dualtropic NL-952 virus. In general, viral replication needs 3 days for a complete replication cycle. Therefore, the amount of p24 present on day three represents rates of single round infection and is a direct correlate for permissiveness. Using the amount of 0,5 ng p24 for infection of cells with NL4-3 leads to complete infection reaching the maximum, the p24 plateau at OD 1,2 (= 27,5 ng p24) within 48 h post infection (data not shown). Since NL4-3 infection was complete at day two, permissiveness of all cell lines for NL4-3 was set to 100%. For NL-911, no infection was observed over the hole time period of 12 days. Therefore, the permissiveness of all cell lines for NL-991 was set to 0%. Compared to the two viruses NL4-3 and NL-911 the permissiveness of cells for NL-952 was 50% for all of the three CXCR4-g1 expressing cell lines in contrast to the two CXCR4-g2 (N176Q or S178A) cell lines who showed a lower permissiveness of 20% and 10%, respectively. However, permissiveness of CXCR4-g1 cells for NL952 was about 300% higher compared to CXCR4-g2 (S178A) and about 400% higher compared to CXCR4-g2 (N176Q) or CXCR4-wt for infection by the same virus (NL-952). In the experiments shown we have analyzed the role of the CXCR4-based N-linked glycans for viral infection. Permissiveness of GHOST cells for the dualtropic virus NL-952 was enhanced due to the expression of the CXCR4-g1 mutants whereas permissiveness for the NL4-3 and NL-911 viruses was not affected by CXCR4-based glycans g1 or g2. CXCR4 is expressed on a variety of cells and is one of the two major coreceptors for HIV. CXCR4 is preferentially present on T lymphocytes and the use of this coreceptor is correlated with a progression of the disease and the development of AIDS symptoms. Therefore it is important to study how HIV accumulates coreceptor usage and is shifting from the R5-monotropic to the R5X4-dualtropic phenotype. Recently it was shown that CXCR4 can be found in antigenically distinct conformations on primary cell types . The CXCR4 coreceptor is subject to a number of modifications like phosphorylation  and can also be sulfated . Moreover, CXCR4 is N-glycosylated, a major modification of proteins, generally involved in stabilization of protein conformation, the masking of binding epitopes  and the shielding of antigenically important epitopes . By using genetically engineered mutants of CXCR4 differing in the presence of the N-linked glycans g1 and g2, we established that there are differences in the relative permissiveness of GHOST cells for the dualtropic virus NL-952. A significant difference in permissiveness was observed between all cells expressing CXCR4-g1 and all cells expressing CXCR4+g1 mutants. The data suggest that g1 might mask a region on CXCR4 that plays a role in the interaction between NL-952 and CXCR4. 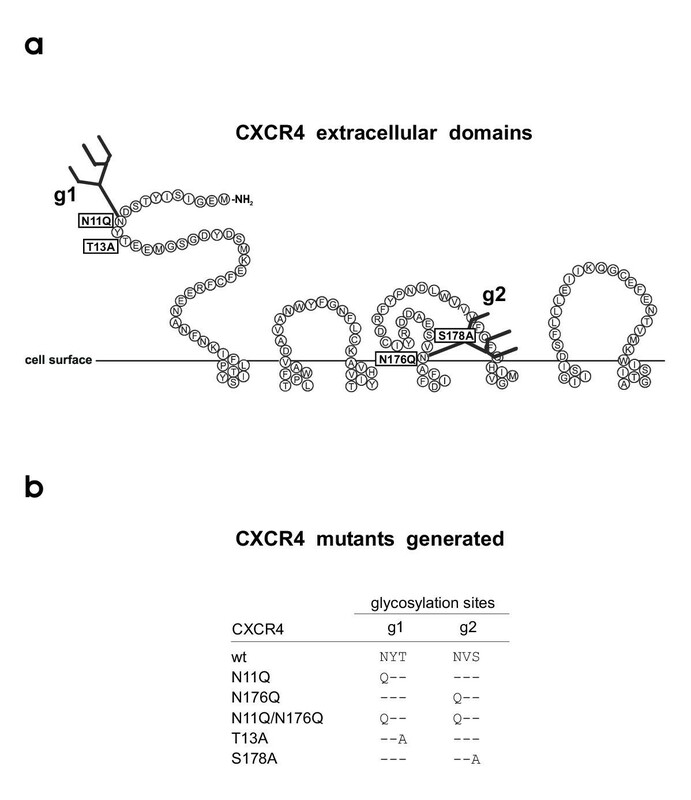 The extracellular domains of CXCR4 contain a high number of negatively charged amino acids in contrast to CCR5 (Fig 5). Glycan g1 is located in the N-terminal part of the CXCR4 coreceptor (pos 11–13) and is next to amino acids Glu14, Glu15 and Glu 32, which are important for CXCR4 function . These amino acids in the N-terminal region and Asp97 within the first extracellular loop might be involved in the binding of positively charged amino acids present in X4-tropic V3 loop sequences. If g1 is involved in the interaction between negatively and positively charged amino acids it probably has an impact on the infectivity of CXCR4-dependent viruses. Charged amino acids in the extracellular domains of CXCR4 and CCR5. 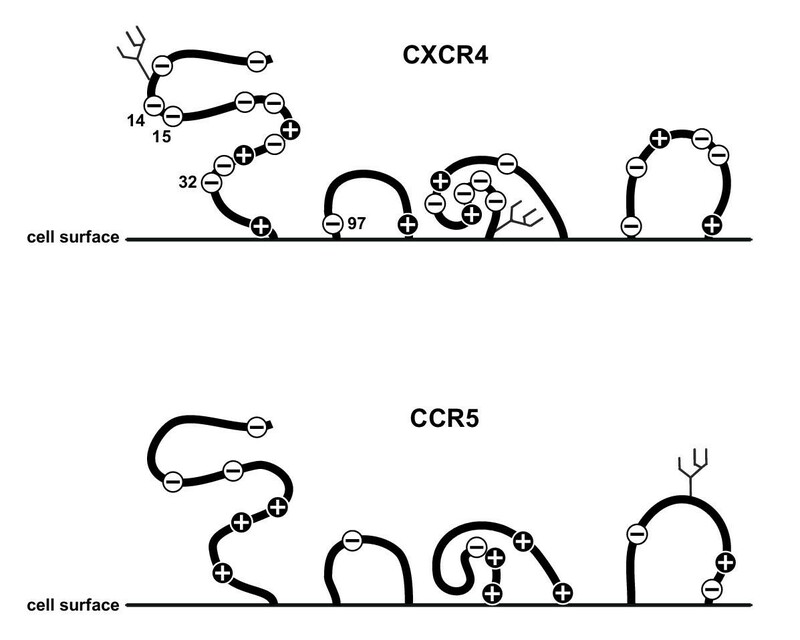 The diagramm shows a schematic representation of the extracellular domains of CXCR4 and CCR5. Indicated are positively and negatively charged amino acids and the glycans attached to asparagine residues. Symbol plus, lysine (K) and arginine (R) amino acid residues; symbol minus, glutamic (E) and aspartic (D) acid amino acid residues. To study the interaction of HIV with its CXCR4 coreceptor we have used recombinant viruses with X4, R5 and R5X4 tropism based on NL4-3. These viral recombinants have an identical genetic background and only differ in their V3 region. The NL4-3 V3 region was replaced against the V3 region of two primary isolates, which showed R5-mono- and R5X4-dualtropism. In addition to the data on CXCR4 mutants, we have shown again, that the V3 loop is the most important region within gp120 to determine viral tropism. By replacing only the NL4-3 V3 loop, the original coreceptor phenotype of the two primary isolates was transferred successfully to the NL4-3 virus. Beside the difference in the V3 loop amino acid sequence the most simple but fundamental difference of these viruses is the presence of positively and negatively charged amino acids in the V3 region. A comparison of charged amino acids for the three V3 loop and the CXCR4 and CCR5 coreceptors is given in Fig 6. The NL4-3 virus contains 12 (5K/7R) lysine and arginine residues in its V3 region and 11 (5K/6R) of these amino acids can be found in the R5X4-dualtropic NL-952 V3 region. The lowest number of arginine and lysine residues was found in the R5-monotropic NL-991 with only 1 lysine and 6 arginine residues. It is known that the overall positive charge of the V3 loop is correlated to the usage of CXCR4 and CCR5 . A high positive charge between +7 and +9 promotes CXCR4 usage whereas a charge between +2 and +3 promotes use of CCR5. Many viruses have an overall charge between these two extremes and therefore can use both coreceptors. Although some examples like NL-952 (+6), exist, the exact prediction of dual tropism based on the overall charge of the V3 region is not always possible [30, 31]. 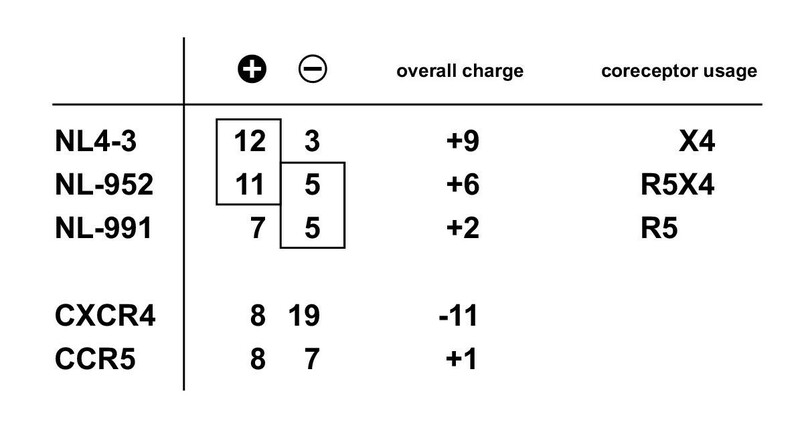 Looking on charged amino acids, the two CXCR4-dependent viruses (NL4-3 and NL-952) have a similar number (12 and 11, respectively) of positively charged amino acids. Therefore they might have the prerequisite to bind CXCR4. Looking on negatively charged amino acids, the two viruses NL-952 and NL-991 share 5 negative charged amino acids that might be relevant for CCR5 binding. Thus, the NL-952 virus that has both of these prerequisites is able to bind both coreceptors. The question was: Do carbohydrates play a role in the interaction between gp120 and CXCR4? For the NL4-3 strain we have shown that the lack of the V3 loop glycan g15 on gp120 enhanced CXCR4-specific infection. For NL-952 we showed that g15 is responsible for CCR5 binding. NL-952 mutants lacking g15 within their V3 loop were unable to infect CCR5 expressing cells but the ability to infect CXCR4 expressing cells remained . From these experiments we have postulated that the glycan structure on gp120 is shielding some positively charged amino acids. This would explain why NL-952 can bind CCR5 and why it looses CCR5 binding activity when g15 is missing. In case of g15 deficiency the positive amino acids might be exposed and not masked by the g15 sugar. Thus, the maximal positive charge of the V3 loop is presented. Under these conditions CXCR4 binding is possible, but not CCR5-dependent infection. From these experiments we hypothesize a role for glycans in masking positively charged amino acids. The function of the CXCR4 g1 glycan might be similar to the function postulated for the g15 V3 loop glycan. A negatively charged CXCR4 coreceptor, as shown in Fig 5, is a good target for viruses presenting a highly positively charged V3 loop (Fig 6) or CXCR4 positively charged ligands like SDF-1 . If g1 is masking some of the positively charged amino acids on CXCR4 it is conceivable that the net charge of CXCR4+g1 is more negative compared to the net charge that is present on deglycosylated CXCR4-g1. The lack of g1 would therefore reduce the overall negative charge of the CXCR4 coreceptor. As a consequence, the dualtropic virus can bind to the deglycosylated CXCR4 coreceptor much more efficiently. In the situation where g1 is present, some of the positive amino acids are masked and the coreceptor is presenting its maximum of negative charged amino acids. Such a highly negatively charged coreceptor surface might be less accessible for NL-952 that has a net charge of +6 compared to NL4-3 with a net charge of +9. The masking of amino acids by g1 has no function on the infection by NL-991 as shown in our experiments. This virus has probably no prerequisites, no high number of positively charged amino acids, which allows CXCR4 interaction. An exposure of a negatively charged surface on CXCR4 with or without glycan g1 might be not sufficient to allow infection of a R5-monotropic virus with a low V3 net charge of +2. It would be interesting to study changes of coreceptor specificities due to the insertion of argine and lysine residues in the V3 loop of CCR5-dependent viruses. The insertion of positively charged residues in the NL-991 sequence will probably lead to a virus that can use deglycosylated CXCR4 more efficiently than the glycosylated wt CXCR4. To test the theory of positively charged amino acids and masking of these residues by carbohydrates needs further investigations using more studies on recombinant mutants of viruses and coreceptors. An important question is: Are mutants or deglycosylated forms of the CXCR4 coreceptor present in vivo? Studies by Baribaud et al. [23, 24] have shown that the CXCR4 coreceptor can be identified on different primary cell lines in different antigenically distinct conformations. The study provided evidence that CXCR4 is present in different forms in vivo and that the heterogeneity observed is cell type dependent. N-Glycosylation is also cell type dependent, thus it is conceivable that the various forms of CXCR4 can be the result of changes in N-glycosylation. In most studies differences in CXCR4 conformation can be inferred by using monoclonal antibodies to CXCR4. The 12G5 antibody was shown to discriminate between CXCR4 conformations. Neutralization of viruses by 12G5 mab was shown to be cell type dependent, allowing viruses to escape from 12G5 mab neutralization . Thus, the epitope for 12G5 mab shows heterogeneity due to the cell line that expresses CXCR4. We also have observed a difference in binding of the mab 12G5 to CXCR4. In our experiments CXCR4 was produced by identical GHOST cells, thus the difference observed in 12G5 binding can be interpreted as an effect of the g1 sugar. We propose, that CXCR4 in a partially or non-glycosylated form is a better ligand for dualtropic viruses. Masking the CXCR4 coreceptor by the carbohydrate structure g1 might block the interaction between the NL-952 and CXCR4+g1 to some extend. Since the viruses used in our study only differ in the gp120 V3 loop region, the enhanced binding to the various CXCR4-g1 mutants can be interpreted as an effect of the mutated coreceptors and the V3 loop. Our hypothesis on the masking of a CXCR4 epitope that might be presented by positively charged amino acids is in part in agreement with data on genetically engineered mutants that differ in the V3 loop glycosylation [35, 11, 15, 17] and with data observed by studying glycosylation mutants of coreceptors [22, 28]. We know that the experiments provided are not a direct proof of this hypothesis, but one more step is made to unscramble the complex interactions of HIV-1 variants with their various coreceptors. Our present observations underscore a role for glycans present on the CXCR4 coreceptor in the entry process of HIV-1. The data will help to better understand the multifaceted mechanism of HIV infection and the selective forces that drive HIV-1 evolution from R5 mono- to R5X4 dual-tropism. The authors wish to thank M.T. Dittmar, H.-G. Kräusslich, G. Nolan and D. Littmann for providing materials. The GHOST indicator cell lines GHOST.CD4 and GHOST-CXCR4 were provided by the EU Programme EVA/MRC Centralized Facility for AIDS Reagents, NIBSC, UK (Grant QLK2-CT-1999-00609 and GP828102), Hela-P4 cells by M.T. Dittmar and Phoenix cells by G. Nolan. The pBABE vector was provides by D. Littmann and the pcDNA3-CXCR4 by M.T. Dittmar. Rabbit serum to p24 antigen was a kind gift from H.-G. Kräusslich. This work was supported, in part, by a DFG grant to M. S. from Sonderforschungsbereich 470 at Hamburg University. This work counts in partial fulfillment of the PhD requirements for S. P. at Hamburg University and I. T. at Kiel University. IT carried out the CXCR4 mutagenesis, the generation of the CXCR4 expressing cell lines and the viral replication assy. SP carried out the generation of virus mutants of NL4-3 with the X4, R5 and R5X4 tropism. MS conceived of the study, and participated in its design and coordination and drafted the manuscript. All authors read and approved the final manuscript.